On May 16, 2018 join artist Jayne Duryea for glass blowing with the ARS Murano Team. 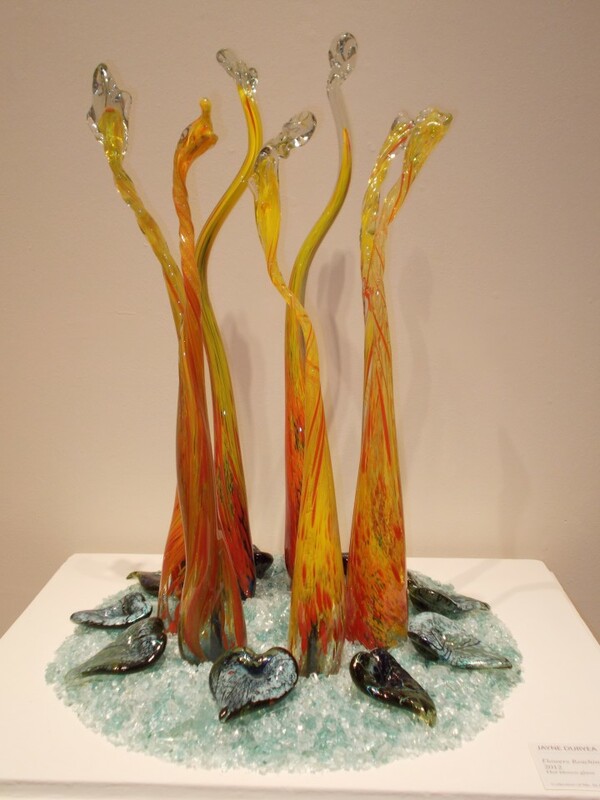 The island of Murano, Italy hosts the 47th annual Glass Art Society Conference May 16 – 19. 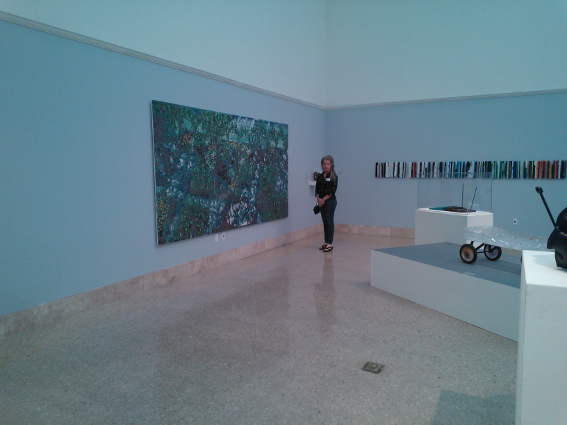 This exhibition opened May 16th and viewable until June 29th, 2014 in Corpus Christi, Texas. Target Texas is a biennial group exhibition featuring Texas artists with a different focus of chosen media for each exhibition. This year's selected media is glass and features the finest works being produced by Texas artists as sculptural and vessel forms highlighting the qualities of transparency, luminosity, and fluidity. 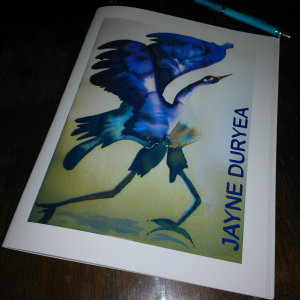 Jayne Duryea was the Guest Curator. — a plasma cutter as her paint brush. — Jayne using a plasma cutter as her paint brush drawing on sheet steel. I have recently become intrigued by drawing on steel with fire. The gestural line and excitement of making marks with fire has become extremely exciting and intriguing to me. These drawings seem to be moving towards a sculptural form incorporating glass as well. I do not know where I will end up but the process is extreme. Exhibition Thursday, November 21, 2013 thru January 19, 2014. 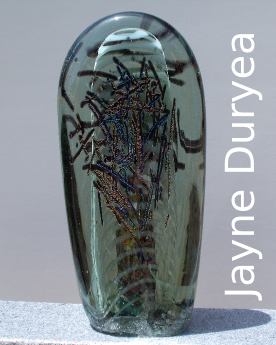 Presenting three-dimensional works by Texas artist Jayne Duryea, focusing on light and color with a deep connection to nature, created through traditional Italian glass blowing techniques. Invitation This show was March 5 – April 17 at the Creative Connections Gallery, Historical Merriman-Bobys House, Heritage Park, 1521 N Chaparral St, Corpus Christi, Texas. Slides from the show. The YouTube exhibition video. 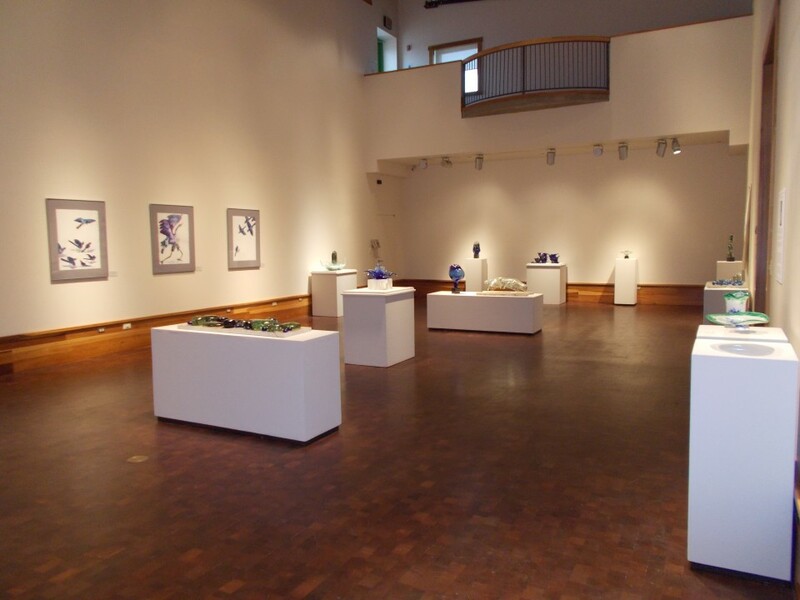 Visit the Beeville Art Museum web site. Email Jayne for information on the 38 page catalogue of the show. Originally from New York, Jayne Duryea has been in South Texas since 1981. Receiving her BFA with additional graduate study from East Carolina University, she completed her masters at Texas A&M University at Kingsville in Painting and Drawing in 1988. In 1989 she became Division Chair of the Fine Arts and also Director of the Simon Michael Gallery as Professor of Art at Coastal Bend College where she has taught since 1981. Extensive travel in Europe, particularly the six month Sabbatical in France, opened many avenues for her work. Through the tutelage of her friend and mentor Robert Willson, she was afforded the opportunity to blow glass at the A.R.S. Murano glass factories in Venice, Italy, during 1996 and 1997. An enriching experience to say the least. Her works can be found in many private and permanent collections throughout the States, Canada, Cayman Islands and France. She is represented by various galleries and is listed in many Who´s Who publications along with a Charter Member of the National Museum of Women in the Arts. Jayne was nominated Texas Artist of the Year for 2008-2009 and 2009-2010. Her vehicle of expression can be found in either paint or hot glass. Light and color, along with a return to nature, for the expression of her sensibilities, are her major concerns. Blown and sculptured hot glass. Glass blowing classes starting in May. Hands on instruction in the blowing and fusing of glass.